In virtually all walks of life, we’ve become a society that wants information and wants it now. Waiting is often an option only if there are no other alternatives. Farmers are no different. 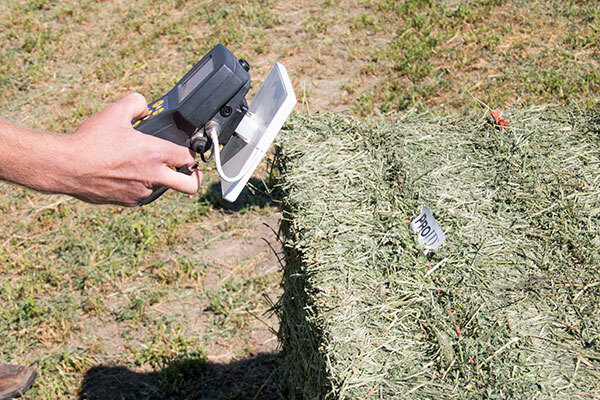 Last fall, the Wisconsin-based company Harvest Tec introduced a technology that calculates the relative feed value (RFV) of large square bales as they are being made. The components of the system are being marketed through large square baler manufacturer dealers. Last week, the technology was discussed and demonstrated at a field day in Logan, Utah, which was held in conjunction with Utah State University. The ISOBUS-capable system consists of several baler components. First is a star-wheel moisture sensor, also developed by Harvest Tec. Load cells that weigh each bale as it exits the chute are also critical to the system. Bale scales are supplied by the baler manufacturer and are optional for their specific models. Along with a baseline fresh forage sample taken at the time of cutting, it’s the bale weight and moisture that are used to calculate the bale RFV. The data is then relayed to an onboard computer and placed on a RFID (radio frequency identification) tag that is attached to the bale before it exits the baler. Information on the RFID tag is stored to an onboard computer or can be read with a handheld reader. As an added option, an applicator that uses food-grade dye can be installed to visibly mark each bale based on the criteria set by the operator. For example, bales over 180 RFV may get three marks, 160 to 179 RFV get two marks, 140 to 159 get one mark, and below 140 are unmarked. 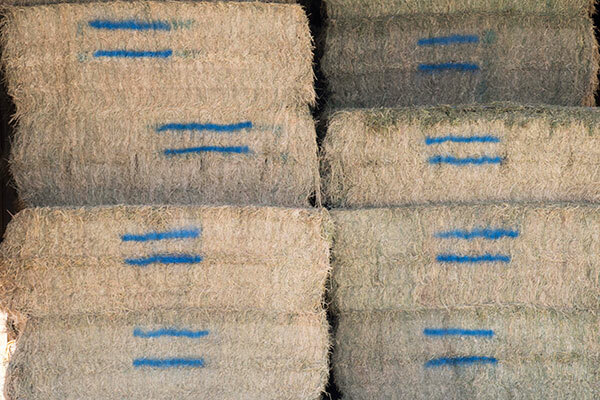 This makes bales easily identifiable for segregated storage based on forage quality. Paramount to the system is the preharvest sample that gets taken. This is done on the day of cutting, and the return sample analysis must be obtained before baling commences. The accuracy of the bale RFV will be contingent on the accuracy of the baseline sampling procedure and analysis. The ability to get a fast return on the sample and to simply get a representative sample of the field is perhaps the greatest challenge to implementing the system. Food-grade dye is used to mark bales as they exit the bale chamber. The Utah State University dairy segregates bales in storage based on their RFV value range. In 2013, Utah State began testing the technology under the leadership of Allen Young, extension dairy specialist. During his presentation at the field day, Young explained that initially three fields were tested across three cuttings for a total of 546 bales. The results were used to calibrate the baler components. In one case, bale RFV values ranged from 140 to 232 for the same field and cutting — a 92-point spread. Young noted that the Utah State milking herd is fed a 60 percent forage diet, and about 62 percent of the forage dry matter comes from alfalfa hay. By using the baler-mounted RFV system, he feels it offers them and similar dairies a big advantage to segregate hay bales by quality as they go into storage; rations can be more accurately balanced for the forage quality actually being fed. Prior to using the system, the best the USU dairy could do was to get a field average of all bales. For the commercial hay producer, segregating bales by quality may also offer some advantages. It becomes easier to capture the premium price being offered for Supreme and Premium hay grades. The technology to measure forage quality as the crop is being baled is still in its infancy. As such, there remain questions and challenges. 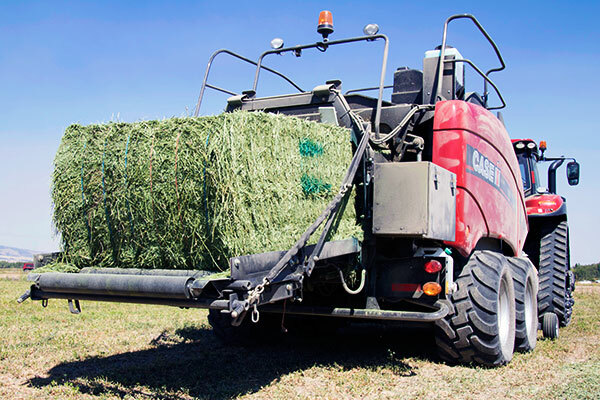 The baseline sample from the harvested field has to be representative of the actual forage quality because all of the baler-generated results are predicated on that initial analysis. This brings into play possible sampling and laboratory errors. Further, there needs to be a relatively short turnaround time. Though the focus of the system is to match the baler-generated RFV values with that of a sample from the same bale that is tested by the laboratory, the inherent error in both systems makes it impossible for that match to be perfect. Perhaps of greater utility than getting the perfect match is simply the fact that bales can be sorted in general forage quality categories. These quality-based “lots” can then be core sampled for a final analysis from which the stack can either be fed or sold. The system is not designed to eliminate the need for sampling and laboratory analysis but rather to segregate bales that differ in quality. Finally, there is the issue of simply using RFV — an outdated metric that still anchors an archaic hay grading system. It’s easy to see why RFV was selected given its association with the hay grading standards, but future improvements will need to include measures of forage digestibility. The current recommendation is to get the bales segregated and then test for other quality parameters. Overall, it appears the technology will have utility for both the forage feeder and seller; it should get even better with time. As with any new technology, improvements will no doubt be ongoing and users will learn how to best maximize its value. For now, it seems that just having the ability to segregate forage by quality may be worth the investment for growers who either feed or sell large quantities of baled alfalfa.